Abstract: If you're a successful graphic artist or making your living in a dot.com company, chances are you spend a lot of time in front of your computer screen. Previously we've reviewed the 19" Acer 99SL and 19" ADI Microscan E66, both of which are targeted at the high end graphics and workstation market. Following suit is the Samtron 95P, a 19", 0.26mm dot pitch monitor utilizing a full square flat face type CRT tube. The 95P is the top of the line in terms of Samtron monitors. Samtron is a division of Samsung by the way. 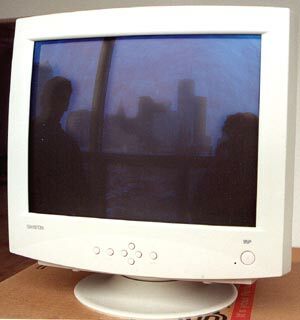 The Samtron 95P monitor, a 19" 0.26mm dot pitch monitor. The 95P comes with warranty, instructions, and power cord. Cost is ~$500 CDNSamtron's 360 degree view. Onto the full specs for this classy little 19" monitor!